Scuttlebutt has it that Microsoft is eyeballing an April date to reveal its next console, in an event similar to what Sony held for the PS4 on Wednesday. While this is very, very thinly sourced, we've heard the same murmuring, and a domain registration by the company that handles Microsoft's E3 keynotes has drawn a lot of attention to. But most importantly, .gifs. 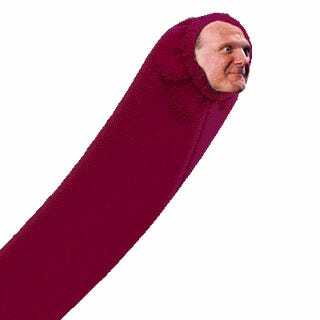 NeoGAF, which spotted the domain registration, finally got the .gif machine cranking early this morning, and when something's getting Ballmer-ized (or Kaz-ified), then good times are just around the corner, right? Scroll down to see the best ones going in this thread, but be warned, the last one is kinda NSFWish and may prompt uncomfortable questions from those who don't understand the joke or phallic imagery. As for the April event rumor, that was also the word going around the press attending Wednesday's PS4 show. An unnamed Kotaku executive named Stephen Totilo tells me he overheard a Sony executive saying he'd heard "they," meaning the competition, were talking about going sometime in "late April." Of course, "they" being far from specific, he could have been talking about when his dry cleaning comes back, or when the Carnival Triumph plans to set sail again. The domain registration was spied yesterday; U.S. Techs registered something called xboxevent.com on Thursday. That outfit handles showcases for bigtime companies, including Microsoft's E3 activities, and registered its E3 2012 site last year. I've pinged a Microsoft Xbox representative about the domain registration, and if he says anything, I'll update it here. OK, that's enough. Let's bring on the dancin' .gifs, which metastasized out of the same NeoGAF thread carrying news of the domain registry. The Living Tribunal takes early top honors. 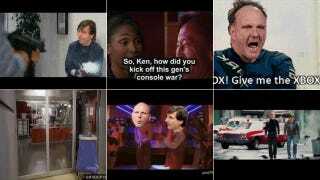 Here's jond76 with Kaz Hirai and Don Mattrick reenacting "Dead Heat." Here's Jond76 one more time.